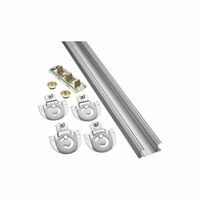 For doors 1-3/8" thick, weighing up to 50 pounds. Aluminum fascia track. Convex track rails provide one point contact between wheel and track. Hangers includes: 7/8" diameter molded nylon machine turned wheel with three point locking plate. Adjustable hangers and door guide. Nylon 1" guide posts high and swivel. 14-16 gauge zinc dichromate plated steel parts. Set contents: (1) 2200F track; (8) 2238 hangers; (2) 1155 track stops and (2) 2155 door stops.